It is my favourite subject to talk about, all things vintage, and so here I am describing a piece of clothing which has been in my family for generations. 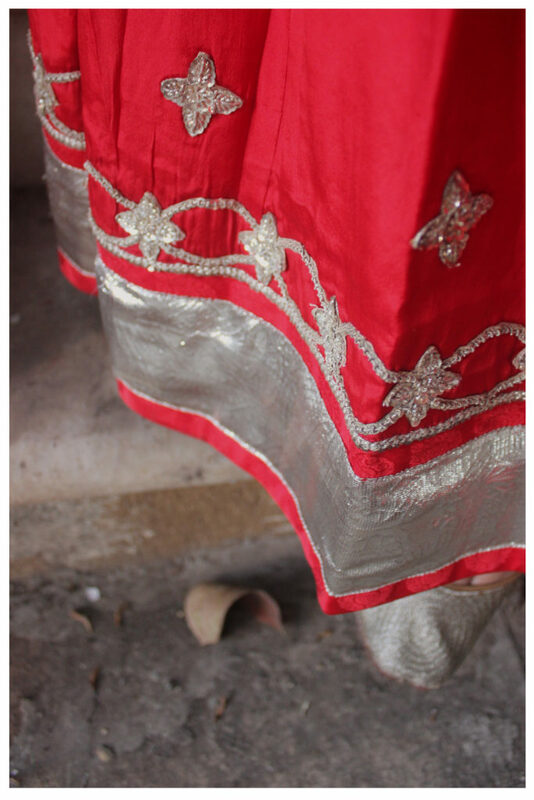 This type of ghagra or popularly known as ghagri, is typically found among families belonging to the Shekhawati region of Rajasthan. This ghaghri was my great-grandmother, Tejwati Sekseria’s. Always made from fabric in solid vibrant colours like aubergene, green, rani pink and red, symbolic to Rajasthani landscape, these ghagris often bear motifs and a border made from real silver also known as bel boota. Since most women would either live or were married into joint families, it would be an afternoon activity in the haveli to collect together, ideate and sew their respective ghagris. The family would collectively purchase lengths of real silver zari of the same design and it would then be divided amongst the women in equal parts so that the next generation could own the exact same thing equally. The original design of the ghagri is a gathered skirt, made from silk which was sourced from China, and it takes about 8-9 meters of fabric to achieve the optimal fall and voluminous gather. 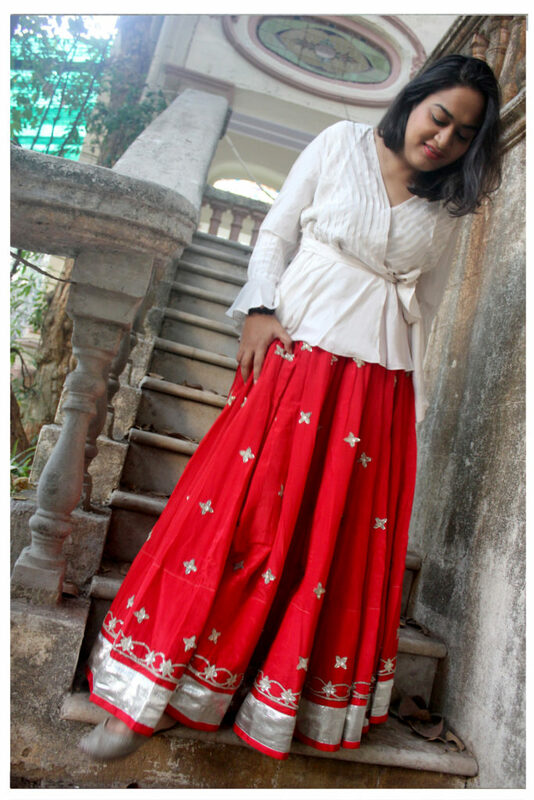 It is not simply a long skirt- like the ghagra – but sits just about 5-6 inches above the ankle because most women, at least in the past, would have worn chunky silver anklets called pajeb below their skirts. 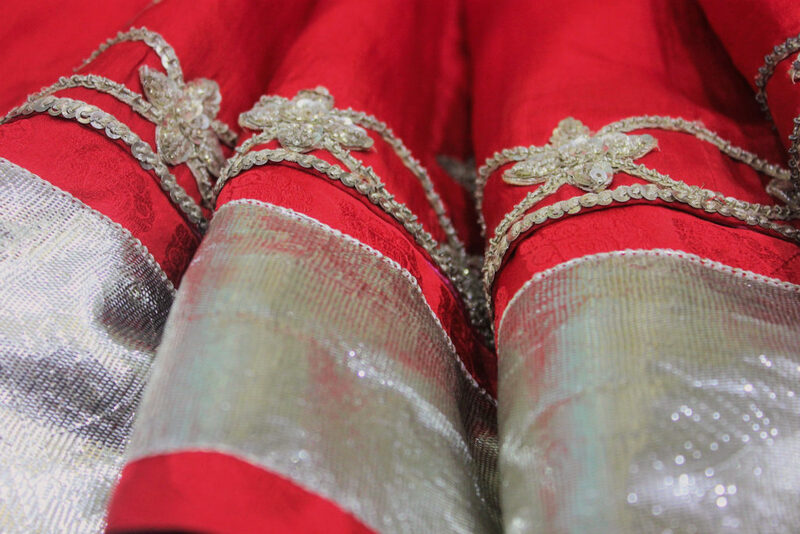 It is paired with an aangi which is tight choli blouse and worn with kanchli, made from a soft mulmul that is translucent so that the choli can show through.A oodhna, a duptta or scarf, about 1.5 meters in length completes the entire set. Even the nada– the string used to secure the ghagri in place at the waist- would be made by a patwa, a weaver, who usually strings jewellery. 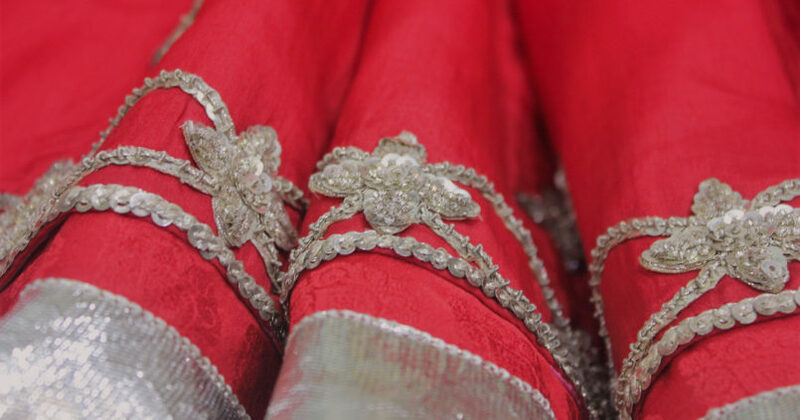 This pure silk ghagri in bright red belonged to my maternal great-grandmother, who wore it at her wedding in the year 1935. It was handed down to my grandmother and further to my mother during her wedding. My grandmother’s family originated from Agra but this ghagri was made and their ancestral village in Rajasthan. And now I take pride in owning and wearing it. 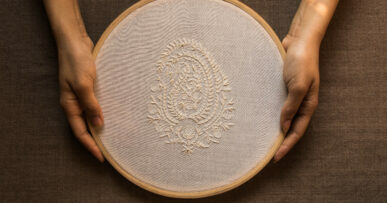 What is incredible is that despite the number of years that this ghagri has existed, as well as the number of hands it has been passed down from, the fabric and all its detailed embroidery is still very much intact. 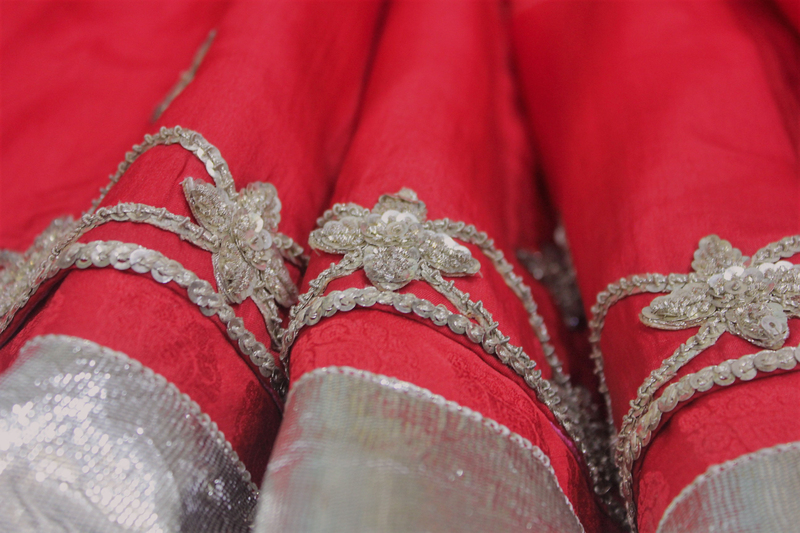 The original real silver zari threads have not yet lost their shine, which makes me believe that garments and ornaments of the past were perhaps made from purer materials than the ones today. And apart from lengthening the skirt to reach my ankles, I have not had to tweak or repair the fabric at all. The norm usually is that when the family wealth is being divided, even the clothes are literally divided. So for example, if there are three sisters and only one ghagri, then the skirt is opened up into a single length of cloth and is equally divided between them. Be it fate or due to some stroke of luck, this ghagri was never divided and we were able to retain in its original glory. For me this ghagri is not just a fashion statement but a storehouse for memory of my maternal grand-mother that I keep close to me even today. Anyone in our family is free to borrow it as and when they wish. It has been worn- by someone or the other- at all the most important events, and it feels as though each time it is taken out, my ancestors has blessed the room with her presence.It evokes a shared history between me and Tejwati Sekseria, even though I only know her through other people’s stories. The fabric, the garment, its presence, its texture, even its feel on my skin, acts as a private dialogue between her and me. 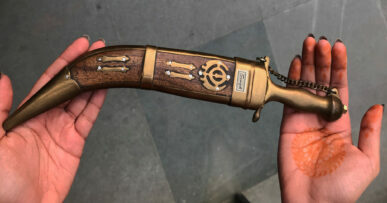 Of course, this and other similar objects, help keel alive our our shekhwati culture, no matter where we might live in the world. 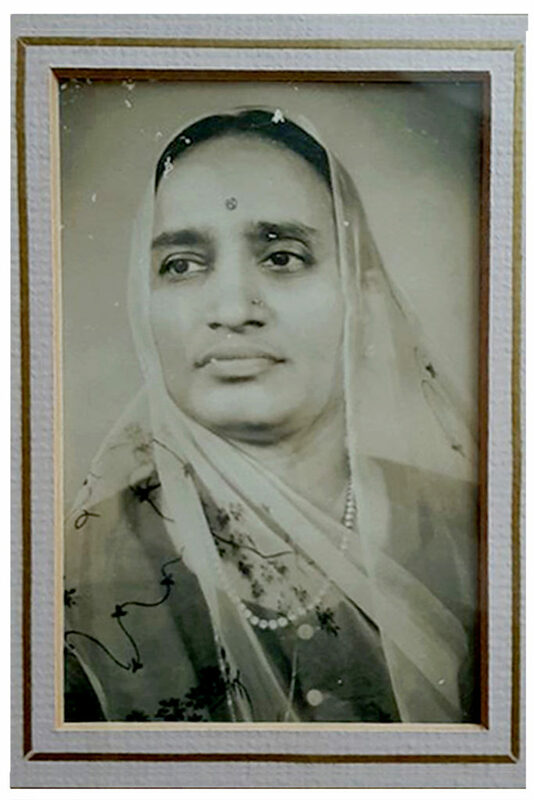 A 24-year old Tejwati Sekseria, born 31.8.1914 in Kanpur, India. Gosh had read this on Instagram and instantly fell in love with the history behind it. 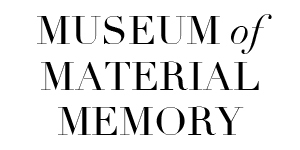 It’s fascinating to read about the actual names of the parts of the garments. And know how and where they were sourced from. Devika is one lucky girl to have inherited such a gorgeous piece of history that she is generous enough to share with her family members for their special occasions. Time to raid Maa’s closet to see what history I can find in it.